No doubt about it: Bookmarks make the Web a friendly place. As you collect bookmarks in Safari, you’re able to immediately jump from one site to another with a single click on the Bookmarks menu or the buttons on the Bookmarks bar. Choose Bookmarks –> Add Bookmark. Press the Command+D keyboard shortcut. Safari displays a sheet where you can enter the name for the bookmark and also select where it will appear (on the Bookmarks bar or the Bookmarks menu). Drag the icon next to the Web address from the Address bar to the Bookmarks bar. You can also drag a link on the current page to the Bookmarks bar, but note that doing so only adds a bookmark for the page corresponding to the link — not the current page. Choose it from the Bookmarks menu. If the bookmark is contained in a folder, move your mouse pointer over the folder name to show its contents and then click the bookmark. Click the bookmark on the Bookmarks bar. If you’ve added a large number of items to the Bookmarks bar, click the More icon on the edge of the Bookmarks bar to display the rest of the buttons. Click the Show All Bookmarks button (which looks like a small opened book) on the Bookmarks bar and then click the desired bookmark. The Bookmarks window that you see in Figure 1 appears, where you can review each collection of bookmarks at leisure. 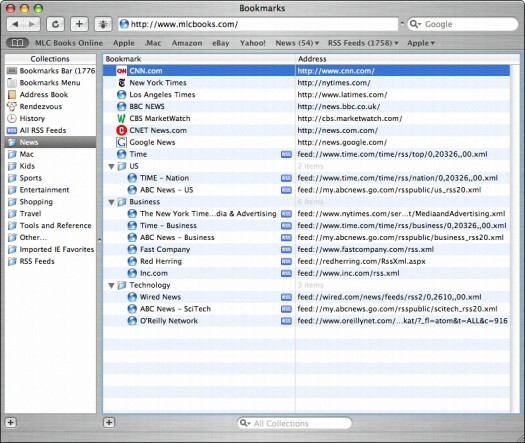 Figure 1: The Bookmarks window puts all your bookmarks within easy reach. The more bookmarks that you add, the more unwieldy the Bookmarks menu and the Bookmarks window become. To keep things organized, choose Bookmarks –> Add Bookmark Folder and then type a name for the new folder. With folders, you can organize your bookmarks into collections, which appear in the column at the left of the Bookmarks window (or as separate submenus within the Bookmarks menu). You can drag bookmarks within the new folder to help reduce the clutter. To delete a bookmark or a folder from the Bookmarks window, click it and then press Delete.